Have new players ever had it so good? A keenly-priced guitar that will impress more than just newbies. Inspiring high mids and trebles. ES-B outclasses a lot of the piezo competition. The lack of bass control on the ES-B could be an issue. The idea that newcomers to the world of acoustic have never had it so good could be a double-edged sword for those who find it hard to settle on their guitar choice. As the level of instrument quality your money buys continues to increase, so does the list of options out there. The last few years have seen interesting developments from some of the acoustic world’s biggest names: Martin embraced the beginner and budget-conscious side of the market with its Dreadnought Juniors, and Guild’s Westerly series affirmed its commitment to the entry-level buyer. But before them, Taylor was putting its instruments into new hands thanks to the Baby and GS Mini travel-sized lines. Now the Californians have turned their attention to a full-size series that could put a Taylor in reach of aspiring players sooner. And we’re all ears. It’s an idea that shatters those first guitar memories of cheese-gratingly high action and warped necks that some of us still shudder at. Like a lot of Powers’ concepts, it makes good sense and manifests in the designs he’s worked on here. The upper body’s armrest is a high- end feature and an inspired design that can encourage a player to connect in those crucial first moments. The Academy aesthetic is simple. The notably light hue of the solid Sitka spruce here won’t be to some traditionalist tastes, but it gives the guitars a clean, defined look that, as we’ll find out, is reflective of performance. Nevertheless, despite the simple acrylic dot fret markers, it’s not completely utilitarian; the laminated birch and fiber rope braid design rosette is understated but stylish. Eyebrows will be raised at the sight of the upper body’s armrest. It’s a high-end feature we saw on last issue’s 814ce DLX, but, again, it’s not here for cosmetic purposes. The inclusion underlines not just the Academy ‘form following function’ manifesto, but also Taylor’s approach to sustainability; this simplified version is made from mahogany left over from cutting neck blanks. While that’s commendable, the choice of mahogany sandwiched between the sapele and spruce looks a little conspicuous for our liking. In practice, though, it’s an inspired design that can encourage a player to connect in those crucial first moments when interest with a guitar can switch to a must-have. 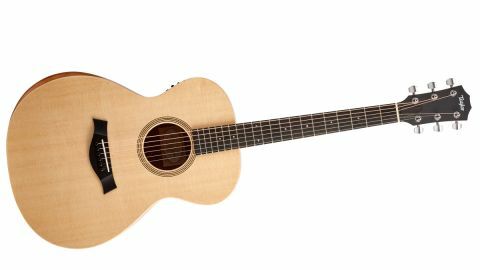 It’s soon apparent that this guitar is not lacking Taylor’s spruce top hallmarks - bright and resonant trebles with assured projection. The low action is extremely welcoming across the ebony ’board, too, and will help open boundaries for aspiring players. Combined with the response of this instrument, it creates an immediately enjoyable playing experience. For softer players, the 12e sounds impressively detailed and nuanced at low volumes. The grand concert’s pronounced high-mids have a wonderfully choral quality in chord work in conjunction with the treble resonance - and it’s positively addictive when playing rhythmic Celtic melodies in DADGAD and E modal - but take things down and the sensitivity to subtlety is inspiring. Keeping the noise down in the lounge at night certainly becomes less of a problem. So far, so reassuringly Taylor. Plugged in, the ES-B represents the qualities of this guitar well. In comparison to the recently-reviewed 10e, this grand concert sounds more organic to us through our acoustic combo, with plenty of treble on tap for holding your own in a band setup. For softer players, the 12e sounds impressively detailed and nuanced at low volumes. Thankfully, it never becomes too brittle or plastic-like in character like some piezos, and we found the flat 12 o’clock tone setting just right for solo fingerpicking. Though the subtler bass allows those jangly high-mids and trebles to continue shimmering, it should be noted with the streamlined Academy approach to EQ there’s no effective way of boosting low-end from the guitar - the tone control is a treble roll-off. Even at the comparatively low price point by the company’s standards, Taylor has serious competition in the market from cheaper models. This is where the ‘Andy Powers difference’ comes into play: this guitar sounds and feels superior acoustically and plugged in than most models we’ve played in their class, with the exception of Martin. There the preference will be personal, but the ES-B makes a strong case for those who need an electro. The Academy Series represents a very clear vision, and in many ways, a dream beginner guitar, as well as potential trade-up for some existing players – one that can inspire and go the distance with a guitarist from bedroom to stage.